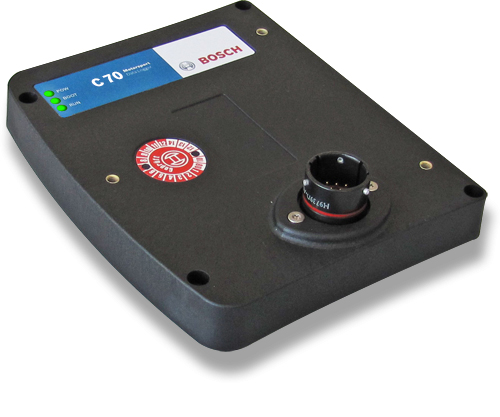 The data logger C 70 integrates a programmable data logging system for motorsport applications for a very competitive price. Additional input devices can be connected via Ethernet and CAN buses. Data Analysis Software WinDarab is available free of charge as “WinDarab V7 free” on our website. The logger can be upgraded to a 2nd logging partition of 1 GB (e.g. for long term recording). For quick data transfer from the car e.g. during pit stop, data copy to a USB stick is available as an option. The stick is connected to the wiring harness for the C 70. The device comes with 4 analogue and 4 speed inputs as standard; further 12 analogue inputs are available as optional upgrade. Supports GPS lap trigger, pre-dated lap time etc.